I have been asked by many friends what we do with our children to teach them how to pray. 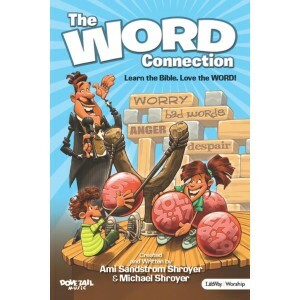 I thought that for now, I would share with you a supplemental devotion that I wrote to directors and kids who are learning The Word Connection Musical this season. This link has audio samples if you want to give it a listen! Prayer is vital to your staying CONNECTED to God. And this is my heart’s desire behind this entire project! Every round in this game show had a theme: Round One – NAME HIM. Round Two – THANK HIM. Round Three – ASK HIM. This is so important to me because Mike and I have been using these three steps all year, teaching our own two children how to pray! And more importantly, how to pray believing in the WORD and in everything that God can do! As a Mom, I can’t promise that every day for my kids will feel like a “Happily Ever After” part of the story. I really don’t know what troubles we will encounter as a family or what personal struggles either one of my kids will face. I do know that we will have an indescribable HAPPILY EVER AFTER someday when we are with the *LORD in Heaven. And thankfully, I know that both of my kids have chosen to follow Jesus and live with Him. But until then we have battles, struggles, good times, and bad times—right here in this world. Some of those struggles, we can control; but many of them, we cannot. That is why praying to God and connecting with Him on an everyday basis (often many times a day) is so important! *We see it clearly: When the kids find personal discoveries of Who God is through Jesus and the Names that reveal His character/attributes, they want to know Him more. They want to surrender to His life living through them, and they want to please Him. Without the Name discoveries, God can seem very distant—more like an unclear, seemingly impersonal force. The Word and Prayer bring together the connection we all need to walk in loving obedience and in the daily realities of God’s Holy Spirit. THANK HIM—After we have each said a few Names to the LORD we begin to take turns thanking Him for the answered prayers in our lives, for our family and friends, and for His many blessings. It is always important to thank Him together, even for things we don’t quite understand. Believe it or not, we also use this time to pray blessing over people who have hurt us, and to rejoice with others who we know have good things going on in their lives, even if we would be tempted to be jealous of them instead. ASK HIM—And Finally, we move into Step Three, and each one of us takes some personal time to lift up to the LORD any needs that are on our hearts for ourselves, for our family, for our friends… for the world. I hope that this musical has helped you in many ways to connect your life in The Word. May you find yourself on a new journey with God, and may your entire family seek a fresh, new journey together! Enjoy this video of Romans 8 a song drawing from selected verses of that familiar chapter in the Word. As we are at the start of this Cre8 adventure, TOGETHER is key! It is comforting to know that God hears our prayers and that If our God is for us, then what can make us fall? And if we stand together, we’ll see His love was in it all! Try new ways in your home to pray together. It’s always worth it and proves to be the best time to connect with what’s going on in the hearts of each family member. * By the way, I wasn’t shouting the word LORD at you. When it is spelled with all caps, it translates, “Almighty God” and who would be the best to hear and answer prayer? God, who is All Mighty!